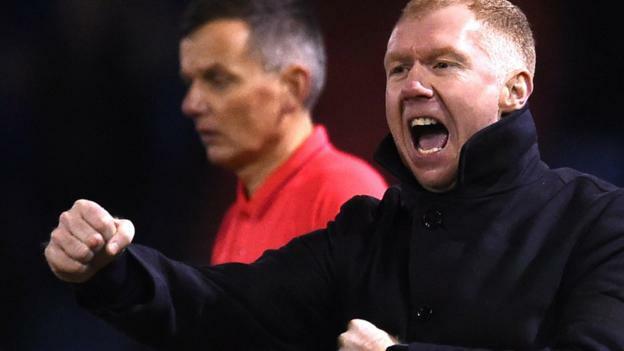 Paul Scholes made a winning start as Oldham Athletic manager against Yeovil Town in League Two. The former Manchester United and England midfielder was appointed by the Latics on Monday, signing a one-and-a-half-year contract to take charge of the club he followed as a child. Jose Baxter curled a shot into the bottom corner to put Oldham ahead in first-half stoppage time, and Callum Lang headed in a second just after the break. Bevis Mugabi pulled one back for the Glovers, stabbing in from a free-kick, but late goals from outside the box from Mohammed Maouche and Christopher Missilou wrapped up the three points for Oldham. Scholes, 44, is the fourth former England player to make his managerial debut in the English Football League this season. Derby’s Frank Lampard was victorious in his first league game as a manager in August, while Fleetwood’s Joey Barton and Macclesfield’s Sol Campbell both lost their first matches in charge.